A clean dishwasher cleans dishes better! If you’ve ever searched your home for a stink and found yourself in the kitchen, your dishwasher might just be the culprit. 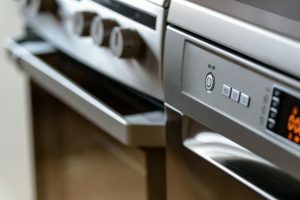 It might be counter-intuitive, but over time the interior of your dishwasher can build-up bacteria and grime that can cause some seriously foul odors. Luckily, cleaning out a dishwasher is a simple task. Just make sure you’re getting your regular maintenance done to prevent any leak causing damage. The mix of food particles, a hot environment, and humidity means that your dishwasher is the perfect place for nasty bacteria to breed. With that in mind taking the time to add regular cleaning to your dishwasher maintenance is important for its long-term health. Start by giving the entire interior a thorough scrub using a damp cloth or paper towels. You’ll want to clean out the screen or strainer that keeps the dishwasher drain from clogging, as well as checking for any buildup on each nozzle. Finally, using a sponge and warm, soapy water wipe down the entirety of the dishwasher including the racks and door. Once you’ve finished your initial cleaning, it’s time to sanitize and remove odors with the help of white vinegar. Place a bowl with one cup of white vinegar in the top rack of your machine; you’ll want to make sure it is standing completely upright. If you would like, you can add a few drops of essential oils to add freshness and alleviate the vinegar scent. You can also use dishwasher cleaners made for this purpose that can help if you have issues with mineral build-up. Next, run the washer at the hottest setting, this will spray the vinegar everywhere, and the combination of steam and acid will kill bacteria and remove any lingering odors. When the cycle has finished, leave the dishwasher door open to dry ensuring that the vinegar scent dissipates and the washer is fully clean. This process should be repeated every few months to prevent any further clogging, damage, or odors. Give Master Plumbing a call at (301) 650-9100 or contact us online to get more information on how our expert plumbers can help you with your smelly dishwasher (or just about anything else plumbing related!). We have received Angie’s List Super Service Award recognition for plumbing and drain cleaning every year since 2007, in addition to the Best Plumber award from Best of Bethesda. We are fully licensed, bonded, and insured, and our service is unparalleled. Give us a call today—you won’t regret it! To see examples of our projects, follow us on Facebook, Twitter, and Pinterest. This entry was posted on Friday, May 11th, 2018 at 2:01 pm. Both comments and pings are currently closed.